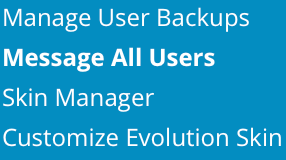 This section provides information how to message all users. Note: This is just short review how to send message to all users. You can find in-depth guide about DirectAdmin message system here. 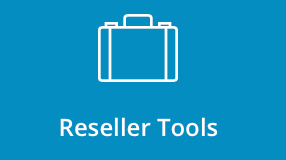 To message all users, sign into the control panel and then click on the "Reseller Tools" icon, followed by the "Message All Users" link. The "To:" field will be preset to "All Users." Select the message priority, message subject, and type your announcement into the message body. Click the "Create" button when you are finished. All your Users will receive the announcement through the control panel's built-in message system.